Regional Worldwide Championship Sites where multiple Clubs (a minimum of 3) play together on a lined field, with an automated timer, will be established throughout the world, strategically located geographically, in an attempt to make it as convenient as possible for all League members to participate. VIEW INTERACTIVE MAP FOR MORE DETAILS FOR EACH REGIONAL COMPETITION SITE. A true, worldwide championship where 3,000+ ELIGIBLE League members and their dogs, from 175+ Toss & Fetch Clubs, in 15 countries, compete simultaneously (in their time zone) on the same day in one of 23 convenient regional locations. Open to League members only: To be eligible, a Team (handler & dog) must have played at least three weeks in at least one League season in the previous year. 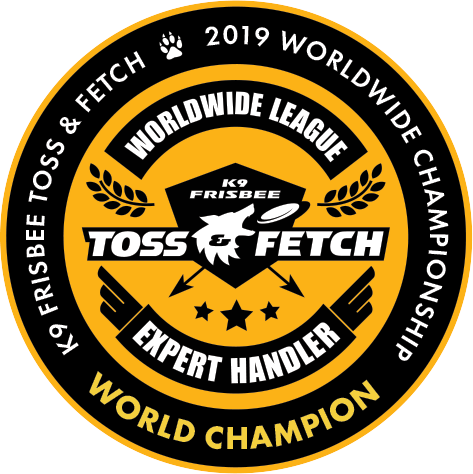 For the Worldwide Championship (WWC), K9 Frisbee Toss & Fetch rules apply EXCEPT play will be on a lined field and all teams will play three (3) sixty-second rounds. Handler’s Division and handicaps will be assessed based on a Handler’s past League Play. In the WC format, only the top 8 scoring “A” Teams on a Club’s roster will earn Club Points, leveling the playing field between large and small Clubs. Handlers may compete with multiple dogs, but only the top scoring “A” Team per handler will be eligible for Club Points. All Teams, however, will be ranked. All Teams (handler & Dog) will be ranked by their cumulative three round scores, plus their handicap. The Best 8 unique handler Teams on each Club will be awarded Club Points, regardless of where they finish in the Overall Individual rankings. Club Points will be awarded from Best (# of participating Clubs x 8) to Last (1 point). Example: If 110 Clubs are registered, 110 x 8 = 880. The Top ranked Team will earn 880 points for their Club, the 2nd eligible Club Point Team will earn 879 points, the 3rd will earn 878 points . . . 880th will earn 1 point). In the WWC format, there are no limits on the number of Teams an individual Handler can enter, as long as they’re eligible. All Teams (handler & Dog) will be ranked by their cumulative three round scores. All Teams run by a handler will be ranked, however, only one dog per Handler, the top-scoring Team, is eligible to score Club Points and for Individual awards. Handlers will compete within their Divisions (Expert/Master/Handler/Junior) so handicap points will not affect Individual ranking and awards. Regional WWC Competition Sites will be determined where multiple Clubs will compete together and judge each other. For a regional site to be valid, at least 3 different member Clubs must be present. A Club must be an established K9 Frisbee Toss & Fetch Club and participated in at least 1 league season in the preceding 12 months. There is no roster minimum or maximum for a Club to be eligible/ranked. (one handler could be the sole representative of their Club). A Team (both handler & dog) must have played on a Club, and posted a minimum of 3 weekly scores in at least one of the last five League seasons. 2019 WWC Eligible Seasons: Winter 2018, SDU, Spring, Summer or Fall 2019. Teams may only represent a Club for which they’ve played in the previous five seasons. Including individual awards for each of the top 8 scoring Club members. After all scores from all the Regions around the worldwide are submitted, A Worldwide Championship Club and individual teams will be honored (awards will be mailed). All Competitors will receive a commemorative, embroidered Worldwide Championship Competitor Patch.